"Even the most unique and interesting characters will not engage readers if their journey-the plot-fails. In this book, bestselling author William Bernhardt reveals the secrets that will keep readers riveted to the page. He explains the importance of matching character to plot and the key distinction between surprise and coincidence. Bernhardt discusses how to enrich your story by layering three levels of conflict and, in the final chapter, analyzes the primary plot structures that have delighted readers since the first story was told. The book also includes exercises designed to help writers apply these ideas to their own writing. William Bernhardt is the bestselling author of more than thirty books, including the blockbuster Ben Kincaid novels. Bernhardt is also one of the most sought-after writing instructors in the nation. He is the only person to have received the Southern Writers Gold Medal Award, the Royden B. Davis Distinguished Author Award (U Penn) and the H. Louise Cobb Distinguished Author Award (OSU), which is given "in recognition of an outstanding body of work that has profoundly influenced the way in which we understand ourselves and American society at large." The Red Sneaker Writing Center is dedicated to helping writers achieve their literary goals. What is a red sneaker writer? A committed writer seeking useful instruction and guidance rather than obfuscation and attitude. Red sneakers get the job done and so do red sneaker writers, by paying close attention to their art and craft, committing to hard work, and never quitting. Are you a red sneaker writer? If so, this book is for you." One of the best books I've read. All writers should read this. Excellent advice presented in a clear and easy to follow manner. Examples to back up each point made, and helpful lists at the end. I loved this book and will be looking for others in this series. 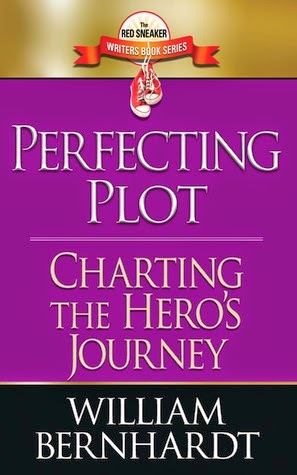 The only negative comment I can make about it is that there is nothing in this book about the plot system known as "the hero's journey" and so the title could be seen as misleading.